a hell LOVE a town: I Just Made You Say "Underwear"
I'm obsessed with podcasts. I listened to Serial way before it was cool to, so hold, please, while I brush my shoulders off. Recently when listening to the podcast of Tim Ferriss, author of The 4-Hour Work Week (and more), I became intrigued by one of his sponsors, ExOfficio. ExOfficio is a company that specializes in travel clothing that works harder than most people do. Their lines include clothing that is bug-resistant, has SPF built into it, and that will refuse to wrinkle after sitting in a suitcase or backpack for weeks. This particular ad on Tim Ferriss had been for ExOfficio's travel underwear and I decided to give it a shot myself. I've never washed clothes while traveling, choosing instead to pack more than I need and tossing things out along the way. But since I was going to be on the train almost every day of my week-long Switzerland trip, I thought I'd do better with a smaller bag. I packed a pair of ExOfficio underwear to save space, in place of a few extra pairs of my normal 'wear. I tried out the Women's Give-N-Go Sport Mesh Bikini Brief in Daiquiri (above left). There are several other styles of underwear as well, including a Hipkini (above middle), Lacy Thong (above right), and Low-Rise Bikini. Each time I wore them, I washed my ExOfficio underwear with my regular shower soap (Olive Oil Smoothie from Little Egg Harbor Soap). I laid the pair flat on a towel and rolled the towel up to remove excess water, as instructed per the tag. ExOfficio underwear is so quick-drying that I could have worn the pair again after just a few hours of washing it - and some of the time, I did just this. Not only is the underwear quick-drying, but it's also odor-resistant, breathable, didn't show lines, and didn't ride up at all. The only downside of the Bikini Brief was that it was a tad higher in the back than I normally like. It would have been peeking out of my skinny jeans so it's not the best night-out option. It would, however, be perfect for days filled with hiking, camping, road trips, sightseeing, and running. 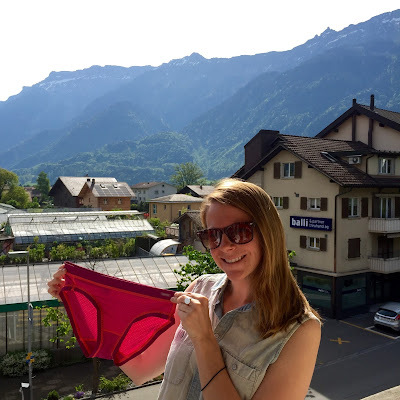 My pair of ExOfficio underwear was so much more comfortable than everything else I brought with me on this trip, that even though I'd worn the pair a few times already, I chose to wear them on the long flight home from Zurich. I'm certainly interested in getting more ExOfficio underwear, although I will try a lower cut style next time. I'd also love to try out other ExOfficio products, specifically their tanks, hoodies, and convertible dresses. Thank you, ExOfficio for the pair of Bikini Briefs to try. This pair retails for $22. Opinions are always my own. I needed these on my AT backpacking trip. Desperately need them, I tell you!